Priority Mail does not Guarantee 4 Day Delivery, Please choose FedEx for Guaranteed Delivery Times. Example: If you place your Rush Embroidery order on Friday it will ship on Monday. Packages are shipped via FedEx, a tracking number will be emailed to you after your package is shipped from our facility. Orders placed after 5pm Eastern Time will not be received until the following business day. 1) If you place your order at 6:15 pm eastern on Monday it will not ship until Wednesday. 2) If you place a Rush Embroidery order at 5:01 pm eastern on Tuesday it will not ship until Thursday. Overnight Example: If you order a non-embroidered item on Monday before 5pm EST it will ship on Tuesday and you will receive it on Wednesday. 2nd Day Example: If you order a non-embroidered item on Friday before 5pm EST it will ship on Monday and you will receive it on Wednesday. will ship Overnight in 2 to 3 business days (Mon - Fri) after the order is placed. issued if such activity or circumstances change the estimated arrival time of an order. My Kids Lab Coat reserves the right to substitute a different shipping carrier with the same cost and delivery date for all domestic and international shipments. INTERNATIONAL CUSTOMERS - We Ship Worldwide! Please see international shipping rates during Checkout. 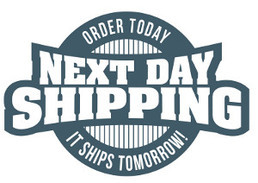 International shipments can take up to 14 Business Days to arrive at your location. Any Taxes or Duty assessed by customs in the destination country are the customer's responsibility.